Kanchipuram or Kanchivaram sarees are traditionally woven sarees from the village called Kanchipuram in Tamil Nadu. 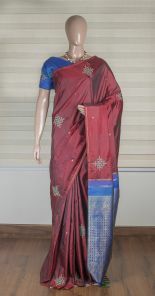 Since hundreds of years Kanchipuram sarees have dominated the world of Indian sarees. Though they are originally from South India, they are the mark of culture for every Indian wedding and traditional ceremony. They are worn for special occasions and festivals and are also considered a family heirloom.